2 A. 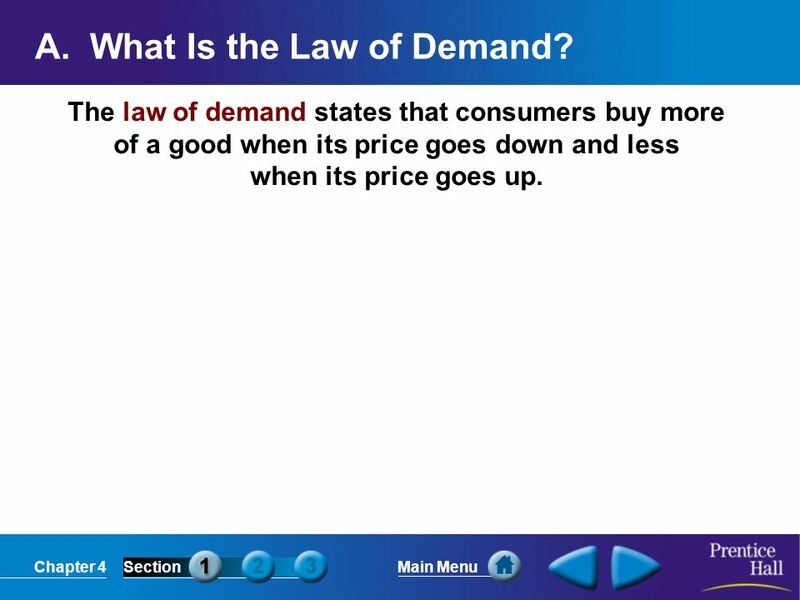 What Is the Law of Demand? The law of demand states that consumers buy more of a good when its price goes down and less when its price goes up. 6 QW: 1. 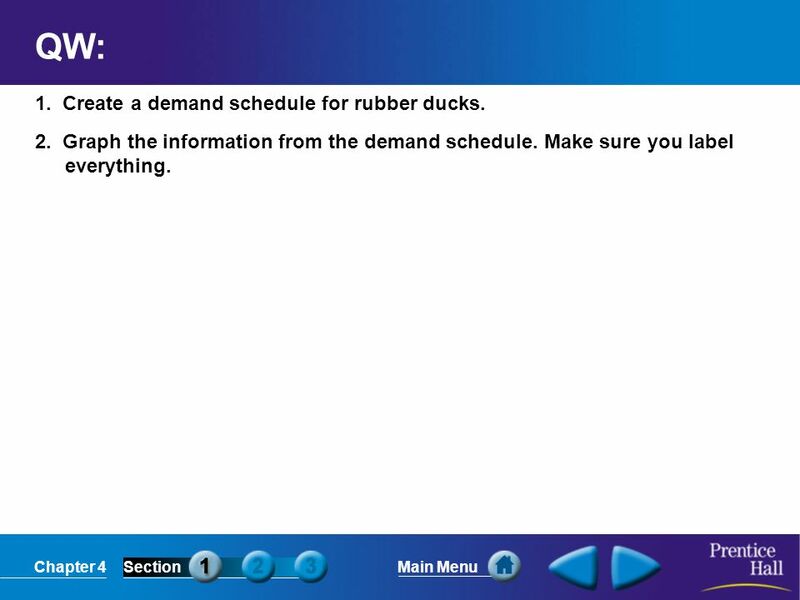 Create a demand schedule for rubber ducks. 2. 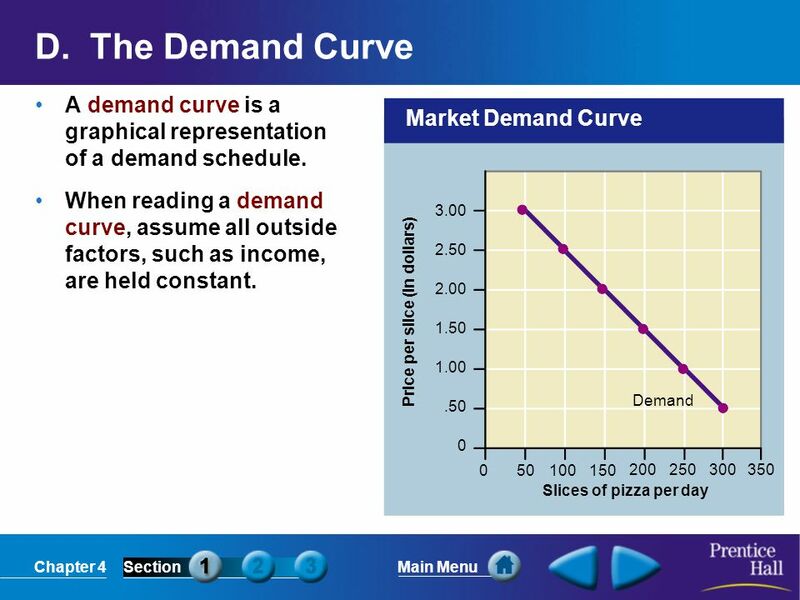 Graph the information from the demand schedule. Make sure you label everything. 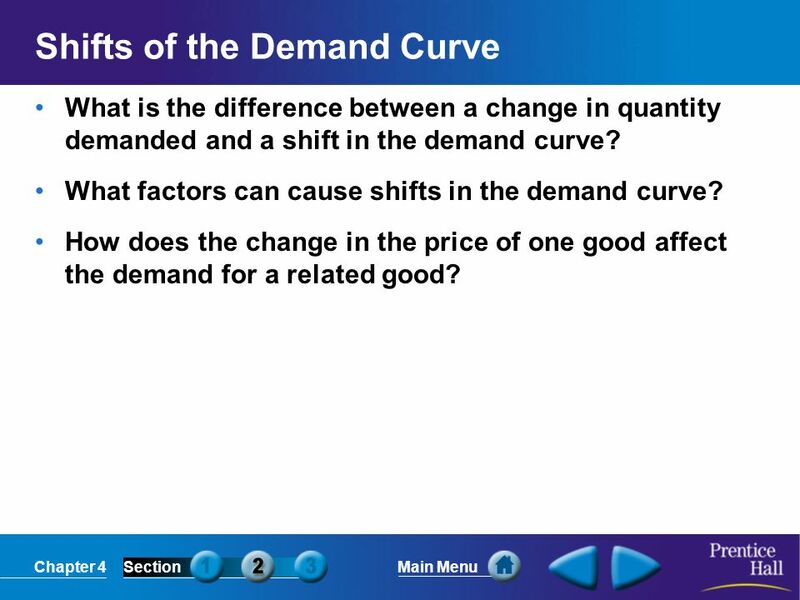 What is the difference between a change in quantity demanded and a shift in the demand curve? 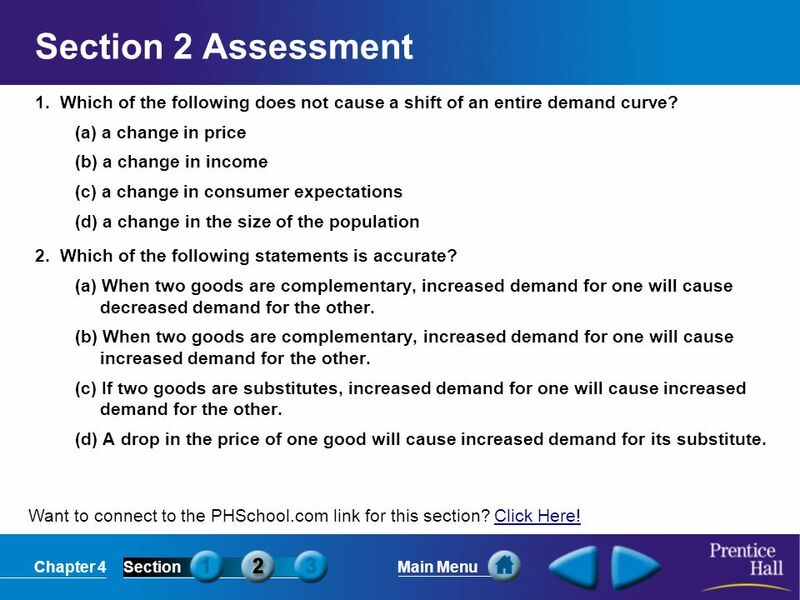 What factors can cause shifts in the demand curve? How does the change in the price of one good affect the demand for a related good? 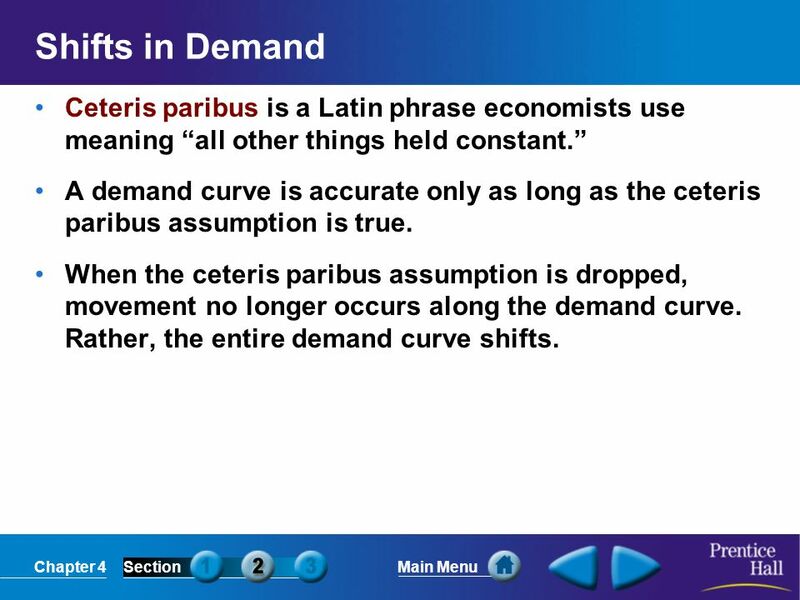 8 Shifts in Demand Ceteris paribus is a Latin phrase economists use meaning “all other things held constant.” A demand curve is accurate only as long as the ceteris paribus assumption is true. When the ceteris paribus assumption is dropped, movement no longer occurs along the demand curve. Rather, the entire demand curve shifts. 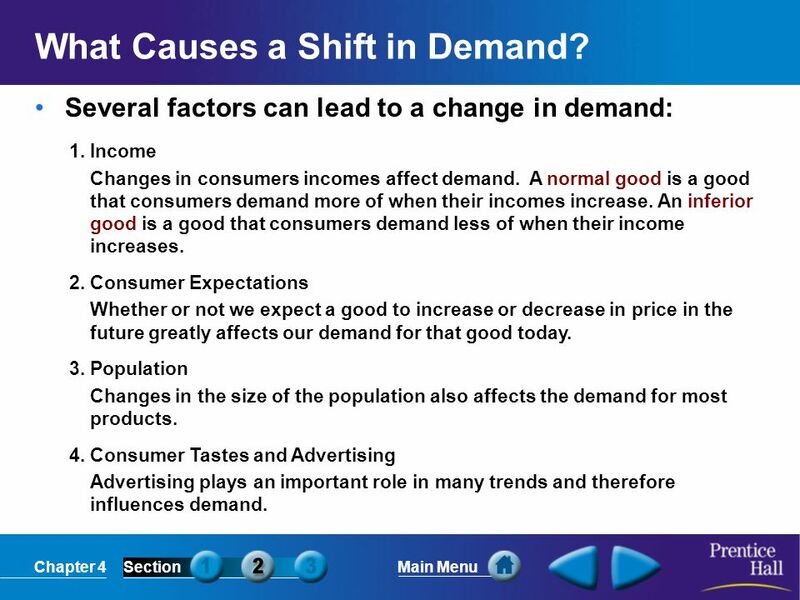 9 What Causes a Shift in Demand? Several factors can lead to a change in demand: 1. Income Changes in consumers incomes affect demand. A normal good is a good that consumers demand more of when their incomes increase. An inferior good is a good that consumers demand less of when their income increases. 2. Consumer Expectations Whether or not we expect a good to increase or decrease in price in the future greatly affects our demand for that good today. 3. Population Changes in the size of the population also affects the demand for most products. 4. Consumer Tastes and Advertising Advertising plays an important role in many trends and therefore influences demand. 11 Section 2 Assessment 1. Which of the following does not cause a shift of an entire demand curve? (a) a change in price (b) a change in income (c) a change in consumer expectations (d) a change in the size of the population 2. Which of the following statements is accurate? 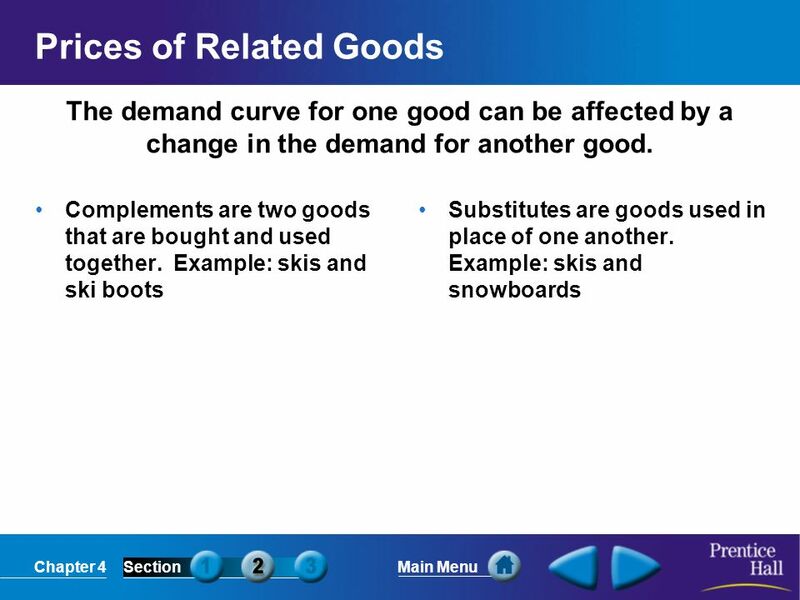 (a) When two goods are complementary, increased demand for one will cause decreased demand for the other. (b) When two goods are complementary, increased demand for one will cause increased demand for the other. (c) If two goods are substitutes, increased demand for one will cause increased demand for the other. (d) A drop in the price of one good will cause increased demand for its substitute. Want to connect to the PHSchool.com link for this section? Click Here! 12 Section 2 Assessment 1. Which of the following does not cause a shift of an entire demand curve? (a) a change in price (b) a change in income (c) a change in consumer expectations (d) a change in the size of the population 2. Which of the following statements is accurate? (a) When two goods are complementary, increased demand for one will cause decreased demand for the other. (b) When two goods are complementary, increased demand for one will cause increased demand for the other. (c) If two goods are substitutes, increased demand for one will cause increased demand for the other. (d) A drop in the price of one good will cause increased demand for its substitute. Want to connect to the PHSchool.com link for this section? Click Here! 13 Elasticity of Demand What is elasticity of demand? 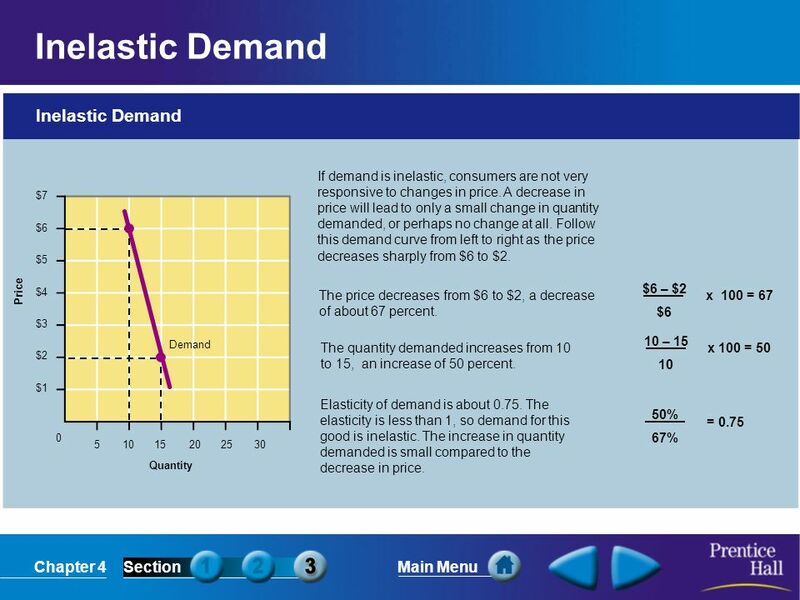 How can a demand schedule and demand curve be used to determine elasticity of demand? What factors affect elasticity? 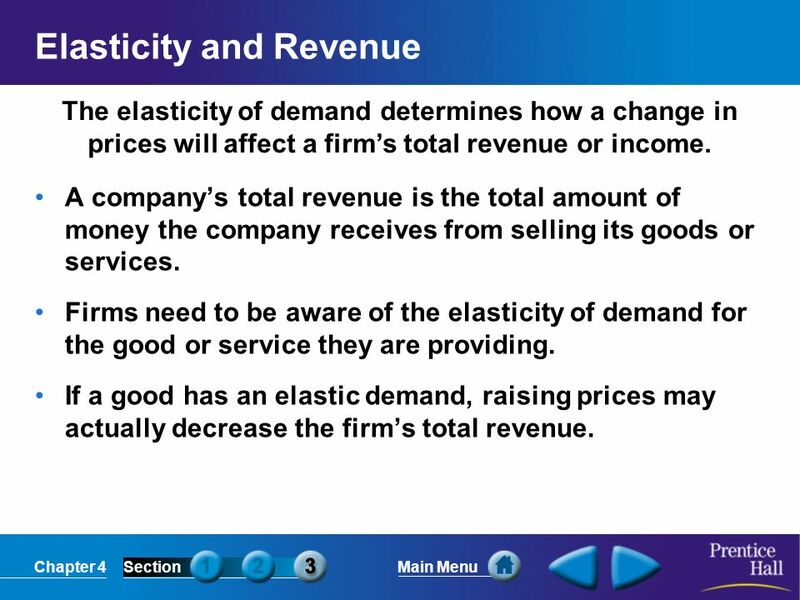 How do firms use elasticity and revenue to make decisions? 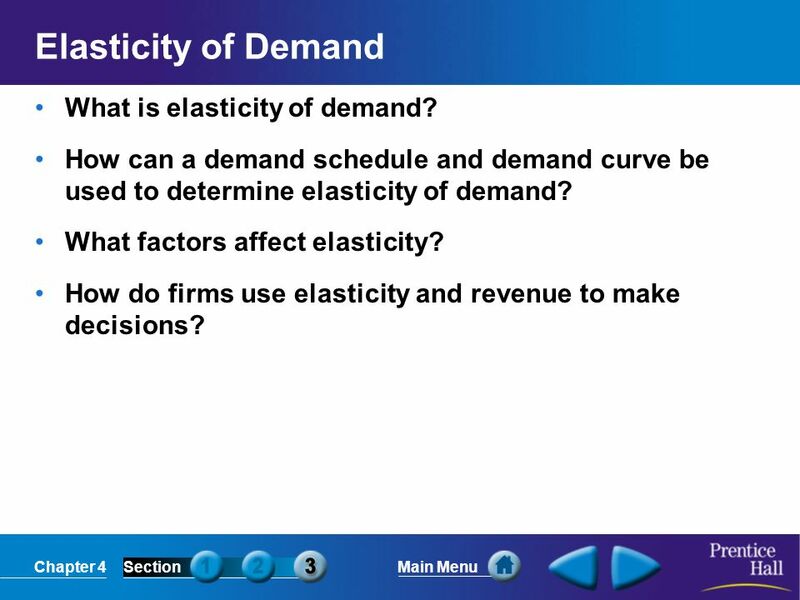 14 What Is Elasticity of Demand? 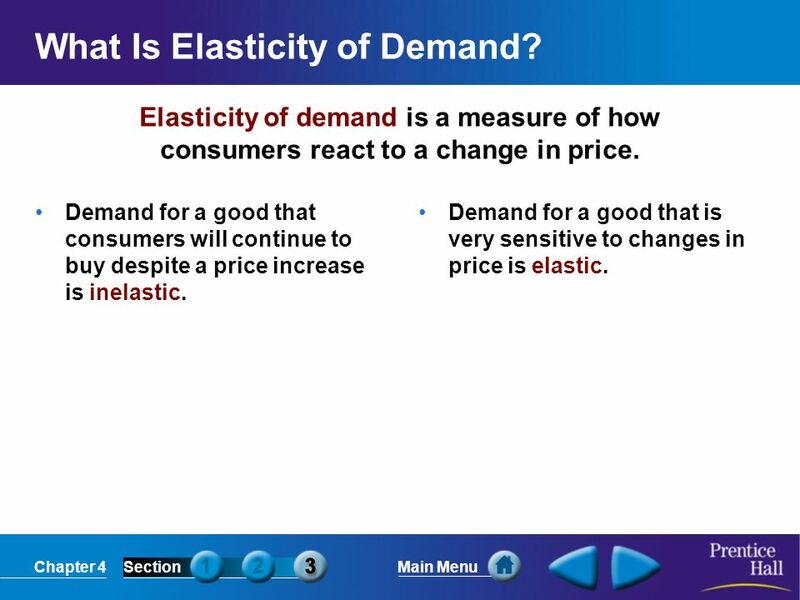 Elasticity of demand is a measure of how consumers react to a change in price. Demand for a good that consumers will continue to buy despite a price increase is inelastic. Demand for a good that is very sensitive to changes in price is elastic. Several different factors can affect the elasticity of demand for a certain good. 1. Availability of Substitutes If there are few substitutes for a good, then demand will not likely decrease as price increases. The opposite is also usually true. 2. Relative Importance Another factor determining elasticity of demand is how much of your budget you spend on the good. 3. Necessities versus Luxuries Whether a person considers a good to be a necessity or a luxury has a great impact on the good’s elasticity of demand for that person. 4. Change over Time Demand sometimes becomes more elastic over time because people can eventually find substitutes. The elasticity of demand determines how a change in prices will affect a firm’s total revenue or income. A company’s total revenue is the total amount of money the company receives from selling its goods or services. Firms need to be aware of the elasticity of demand for the good or service they are providing. If a good has an elastic demand, raising prices may actually decrease the firm’s total revenue. 20 Section 3 Assessment 1. 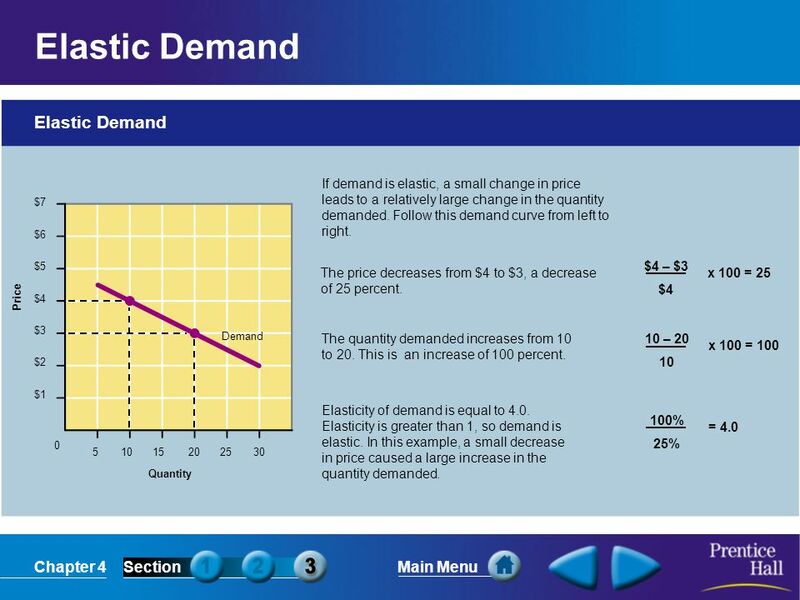 What does elasticity of demand measure? (a) an increase in the quantity available (b) a decrease in the quantity demanded (c) how much buyers will cut back or increase their demand when prices rise or fall (d) the amount of time consumers need to change their demand for a good 2. 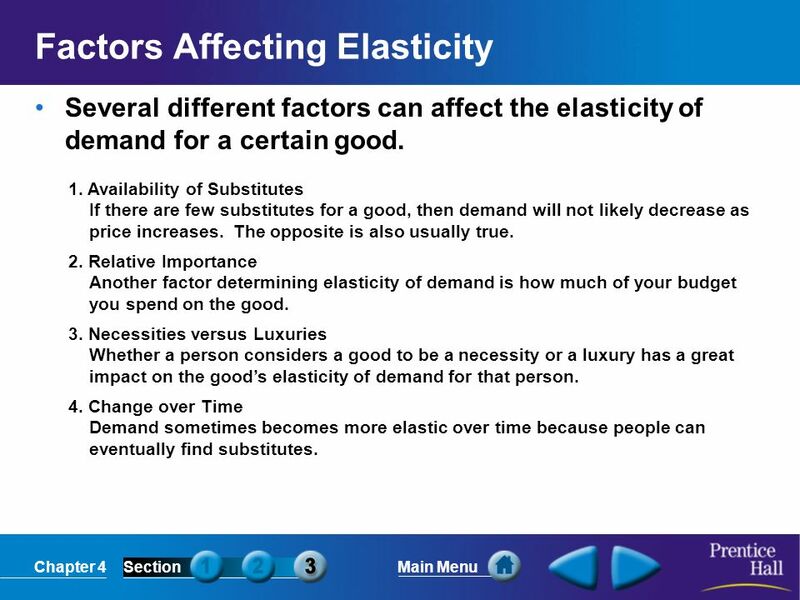 What effect does the availability of many substitute goods have on the elasticity of demand for a good? 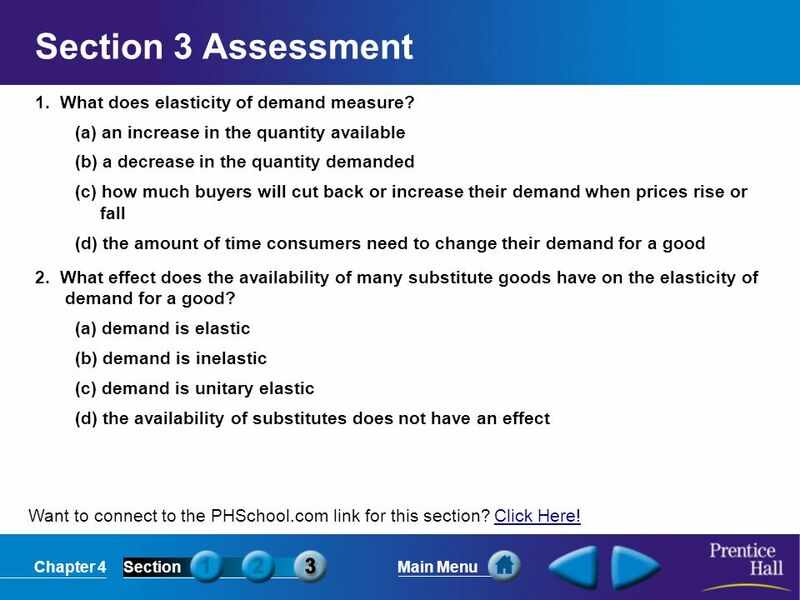 (a) demand is elastic (b) demand is inelastic (c) demand is unitary elastic (d) the availability of substitutes does not have an effect Want to connect to the PHSchool.com link for this section? Click Here! 21 Section 3 Assessment 1. 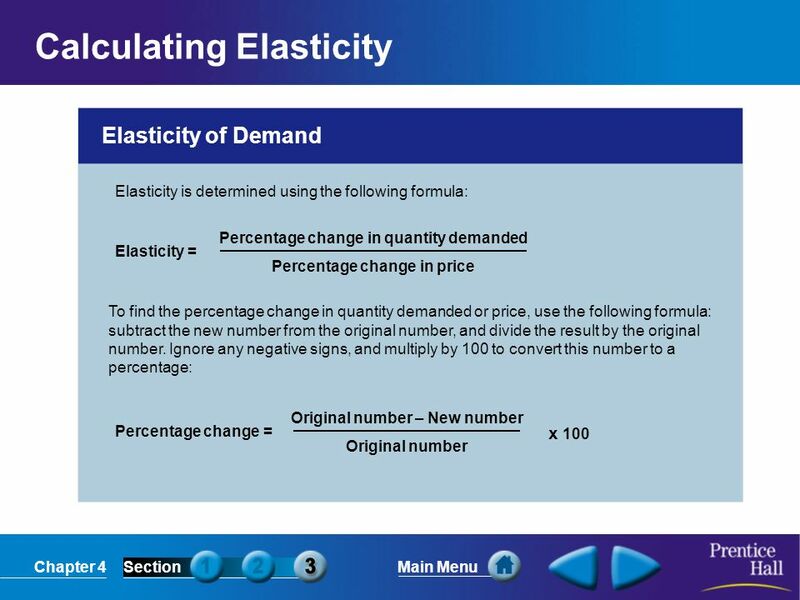 What does elasticity of demand measure? Chapter 4 The Law of Demand. 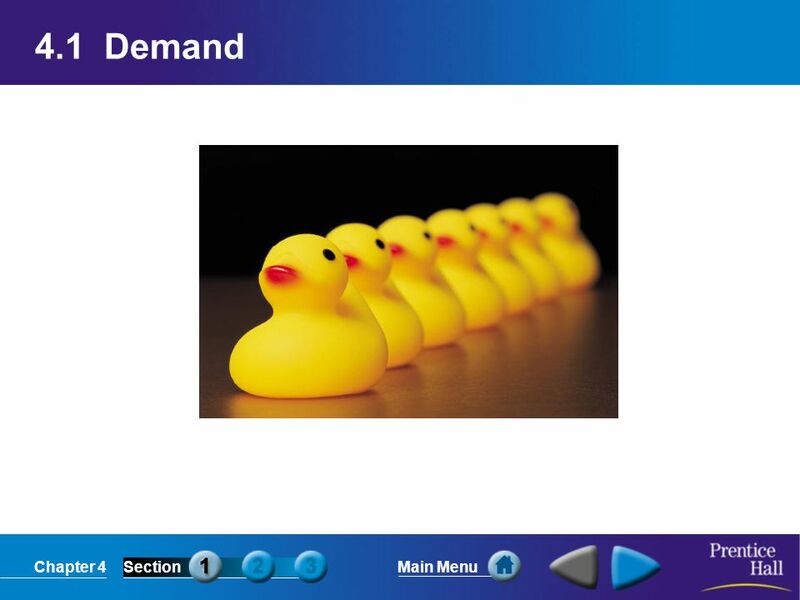 Understanding Demand What is the law of demand? Chapter 4 Demand-the desire to own something. Chapter 4 Demand Retrieved from: Northern-Virginia-Real-Estate. 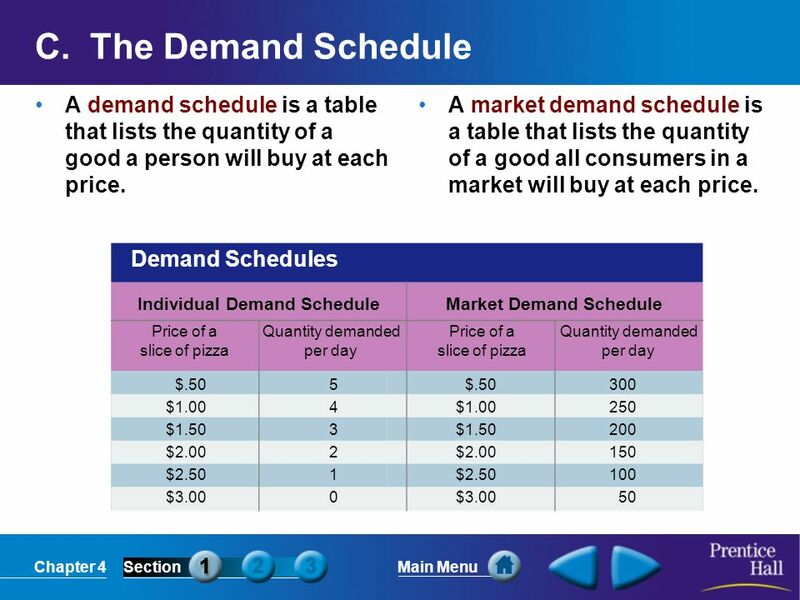 Chapter 4SectionMain Menu Understanding Demand What is the law of demand? 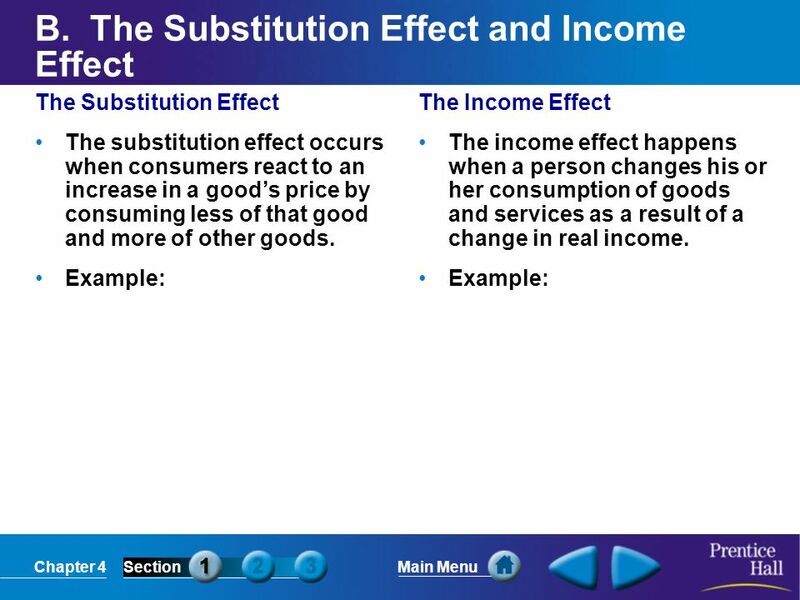 How do the substitution effect and income effect influence decisions? What is. Presentation Pro © 2001 by Prentice Hall, Inc. Economics: Principles in Action C H A P T E R 4 Demand. Economics Chapter 4 - Demand. What Is the Law of Demand? The law of demand states that consumers buy more of a good when its price decreases and less. Chapter 4: Demand Zachary Mcguire Desi Diaz Margarida Coimbra Nicole Gonzalez Andrea Guitierrez.